Ten up-and-coming designers were tasked with incorporating Intel technology into everyday clothing. When it comes to the fashion world, technology seems to fit right in. Intel partnered with the Council of Fashion Designers of America (CFDA) and the Vogue Fashion Fund for their annual CVFF Design Challenge, empowering 10 up-and-coming designers to create unique wearables that incorporate Intel's Curie technology, which provides computing power for wearable devices in a chip the size of a shirt button. In addition to incorporating the chip, designers were challenged to have their creation showcase a personal memory, enhance an emotional connection to an event or elevate an experience. Among 10 final contestants, Laura Vassar and Kristopher Brock of Brock Collection took home the $400,000 prize and a year of mentorship with their custom design. The runners up were designers Stirling Barrett of Krewe du Optic and Adam Selman. Read on to see what the winners came up with and to check out the other futuristic design concepts. A hand-carved horn label that provides personalized styling tips. Winners Laura Vassar and Kristopher Brock are the brains behind luxury womenswear label, Brock. The nostalgic duo was inspired by their childhoods growing up in the country. To incorporate this memory, they embedded the Intel Curie chip into a hand-carved horn label that lives on the back of a coat. The chip connects to an app that gives personalized styling tips to its wearer. Sunglasses that double as a camera. Sunglass company Krewe Du Optic and its designer and challenge runner-up Stirling Barrett strive to preserve the culture of New Orleans through its frames. Using the Intel Curie chip to support his vision of preservation, he envisions sunglasses that capture memories in a more “natural-feeling way” than using a smartphone. Essentially, the sunglasses have a small camera and are able to take photos throughout the wearer’s day. A brooch that notifies the wearer of appointments, emails, Uber rides and more. Runner-up Adam Selman is a costume designer, most recognized for creating Rihanna’s red carpet looks and on-stage getups. Combining the efficiency and helpfulness that technology has to offer with his sense of fashion, Selman has designed a rose-shaped brooch with the Intel Curie chip that helps notify a wearer when it’s time for an appointment, an email is received, an Uber has arrived and more. 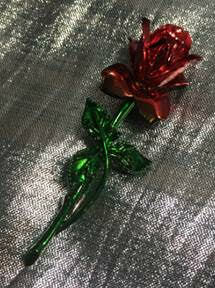 The brooch will sync to a smartphone to light up or vibrate whenever it gets one of these notifications. A silk mask that helps wearers sleep better. Inspired by her favorite childhood film The Wizard of Oz, up-and-coming fashion designer and artist Morgan Lane designed a silk mask to help the wearer sleep better. The mask is adorned in illustrious patterns, with the Intel Curie chip situated inside the accessory's strap to measure brain waves and temperature. With these measurements, the mask has the ability to identify the user’s sleep stage and even steer them away from bad dreams by controlling temperature. Clothing that disables nearby smartphones. Laurence Chandler and Joshua Cooper are the designers behind men’s fashion label Rochambeau. A self-cooling blazer that regulates body temperature and heart rate. Ji Oh, an international fashion designer from South Korea, creates delicate and balanced designs for women. With the Intel Curie technology sewn in, she has designed a self-cooling blazer that tracks heart rate and body temperature. When heart rate or blood pressure goes up, the blazer detects this and helps to neutralize it and keep the wearer cool and comfortable. Boots that track a performer’s movements and enhance onstage visuals. Sisters Maryam and Marjan Malakpour are the masterminds behind L.A.-based shoe and handbag brand, NewbarK. The sisters will add the Intel Curie chip as an extension to their current mid-ankle heeled boot. The boot will then track a stage performer’s movements onstage and send the data to a connected lighting system. The lighting system will be able to adjust the lightings and visuals happening onstage in real-time. Lace-up booties that make recommendations about places nearby to go. Chloe Gosselin in lace-up booties with Curie chip. Influenced by music, contemporary art, photography and vintage aesthetics, Chloe Gosselin is a French-born shoe designer. For the competition, Gosselin was inspired by a childhood visit to Claude Monet’s Giverny gardens, designing a pair of lace-up booties embedded with the Curie chip. The booties are designed to tell the wearer about her environment. The boots will make recommendations about nearby places to go and things to see, and share information about objects nearby. Garments that tell their story. Chris Stamp is creator of Stampd, a West Coast contemporary lifestyle brand. By installing Intel Curie chips into various garments, the technology provides the user information specific to the piece they are wearing -- including its inspiration, where the materials are from and a fully interactive map showing how exactly the piece got from the factory to the hands of the customer. A dress that visually changes according to the wearer’s movements. The designers envision a dress that uses the Intel Curie chip to learn the gestures of a wearer’s movements. By learning these movements, the technology will change the visual aspects of the dress such as illuminating embroidery and LEDs throughout the dress.